After the rapture tomorrow night, there won't be any need to keep writing blog posts about science. If you haven't heard or seen their thousands of billboards, Top Christian, Harold Camping, has used voodoo math to determine that this Saturday marks the rapture. The rapture is when True Christians(TM) will be taken off to heaven while the rest of the world suffers with wailing and gnashing of teeth. As Laura Lebo points out, Camping means anyone except for: Jews, Hindus, Muslims, Buddhists, atheists, agnostics and anyone who supports gay marriage or accepts evolution. Camping has also let us know the time of the great earthquake signaling the rapture: 6 pm. Local Time. That's right. Instead of taking them all up at the same time, there will be 24 different raptures set to your own time zone. Don't let the fact that camping was wrong in 1994, prevent you from being ready on Saturday night. Throw a party. Have some fun. It's the end of the world! While I may mock this incredibly silly story, it has had real effects. People have quit their jobs, spent all their money, and have made May 22 an embarrassing day for themselves. Some parents asked to have their child's class load lightened in this spring so they don't have too much stress before the rapture. But this is not interesting for tragedy of what happens to the families and children next week. I am interested in the twisted psychology which will let them believe thy were correct even though they were shown to be so wrong. Just like the backlash after Obama released his long-form birth certificate and judo-chopped Osama in the eye, Camping's followers will more than likely double down on their crazy ideas. Whatever happens, some people will have some great parties this weekend. See you next week. Maybe! Paul Wallace wrote an interesting article for the Religion Dispatches making the claim that evolution should be taught in church. I agree wholehartedly with the premise. Every week we hear news stories about laws proposed in state legislatures to bring creationism into the classroom. While the seek to force their "truth" upon us, Wallace hopes to bring a sense of wonder to the pew. If anything, we could at least get rid of these images. Current in Divinity School, Wallace talks about his introduction to the wonders of nature and ultimately to God. He sorts church-goers into two groups: those coming for the answers and those coming for the questions. Most Fundamentalist Christians would fit in the Answers category. They come to church, listen to the preacher, and read the Bible to find the answers to life's questions. The Bible provides all the answers if we simply understand it. With that view, Creationists pack the school boards, propose laws, and otherwise subvert science education because they already have all the answers they will every need. But at least they are willing to share the answers. On the other hand, some people go to church to uncover more questions. A reading of the Bible produces far more questions than answers and starts an intellectually fulfilling theology. The Questioners find more enjoyment in not knowing, much like most scientists. These Christians are much more open to understanding evolution as a path to further understanding God. I think all Christians could benefit from learning about evolution (as could everyone, which is why it is in State Curricula). Almost every argument I have heard against evolution comes from a deep, misconception about the theory itself. Creationist documents routinely mischaracterize evolution and science itself. As a high school teacher, I have heard many strange caricatures of evolution. In church, I learned more of them. Now that I have a better understanding of evolution, I can counter such problems by educating the others. One place to do that is in the church. I would love an opportunity to give an evolution lecture to a creationist crowd. I would correct their misunderstandings by showing that Christianity has nothing to worry about from science. Most importantly, I would answer their questions to the best of my ability. In their questions, you can really find out what they think. So let's preach evolution in church! Eugenie Scott, of the National Center for Science Education (NCSE), and others objected to a couple of words that were eventually removed. 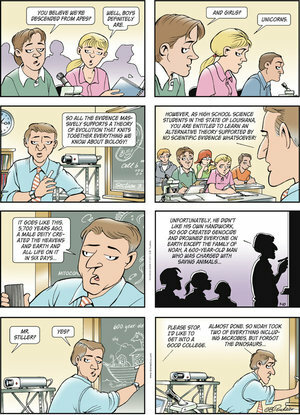 As people debate the relationship between science and religion, many others in science education hope to find a common ground between the two to allow us to teach without completely offending religious students. The NCSE sits in the middle and takes its lumps from both extremes. One of my favorite evolution cartoons. In this case, the NCSE lobbied for the removal of the terms "unsupervised" and "impersonal" from the definition. While the original definition upset the religiously inclined, the new definition has fed the attacks from the atheists. Jerry Coyne posted a response to the news on his blog Why Evolution is True defending the materialistic meaning behind such words. First of all, we all agree on 95% of the definition of evolution. As described by Charles Darwin, evolution occurs by descent with modification. As genetic material passes from parent to offspring, some individuals mate more often and minor mutations accumulate over time. Natural selection and genetic drift act as environments change. These mechanisms account for the massive biodiversity we see in the world from the remarkable, yet imperfect, human body to the oddities of life. Does "unsupervised" or "impersonal" really affect a person's ability to understand evolution? Not really. There is no evidence for or against a supervised process as evolution. Many Theistic Evolutionist simply view natural selection as the tool God used to guide evolution. But regardless, supervision or unsupervision is not a requirement of understanding the processes of evolution. The mechanisms of mutations and selection can still be taught without an outright attack on the religious students in the class. Removing the words, may help more students accept learning about evolution and make no change in the understanding of the science. Evolution is still natural and unpredictable. If we rewound the history of life and tried again, we have no certainty that humans would show up again. Yet we constantly search for signs of intelligent life as far as our telescopes will listen hoping the evolution stumbled upon the same design elsewhere in the cosmos. University professors have far more leeway in this regard than high school teachers which makes Coyne's objections rather predictable. This small change to the definition of evolution will upset the atheists for a short while, but will have very little impact on the actual teaching of evolution in schools. The NCSE and the NABT will still fight for quality science education for all students. We teachers will still teach the mechanisms of evolution and the wonders of life. And we will still debate the compatibility of science and religion. For the Speakeasy Blog with The Wall Street Journal, Ricky Gervais wrote a thoughtful article explaining why he is an atheist. Gervais is a brilliant comedian who brought The Office to the US. While I may disagree with his final conclusion, he points to some interesting things. Too often Christians attack atheists demanding their reasons for their lack of belief. We believe and they don't. In the end, their choice really doesn't affect me. Unfortunately, some Christians are very willing to force their beliefs onto others and infringe on their rights. Let's be honest: Does someone else's faith really affect you at all? Live your faith, and let them live theirs. 75 percent of Americans are God- ‐fearing Christians; 75 percent of prisoners are God- ‐fearing Christians. 10 percent of Americans are atheists; 0.2 percent of prisoners are atheists. Gervais discusses the virtues of science as well. Science has theories based on observable data, and responds to facts that may alter our understanding. But, the benefits of science are not the sole domain of atheism either. Atheist may accept scientific ideas more readily, many scientists profess a faith in a particular religion. The conflict does not boil down to science on one side and faith on the other. There is science and religion. How you interpret the science in turn affects your religion. Some perceive the lessons from science as evidence for atheism, while others view science as way to understand God. Christians should not attack atheists for their lack of faith, just as atheists should go about their own business. To each his own. Let us just live a good life and try to make things better for others. This is both a Christian and a social virtue. I suggest both believers and non-believers check out Gervais' essay. By the way, I also suggest this clip from his stand-up routine which I have already posted once. John Hollier wrote this article for the Guardian Science Blog that may bug some Creationists. The amazing biodiversity of life on Earth seems at odds with a global flood phenomenon roughly 5000 years ago. Hollier looks at the specifics in diversity of insects throughout the world. While we know of 1 million insect species, there could be as many as 30 million yet unidentified. Even with the incredible numbers, there are only about 30 different orders of that class. While they are all different, they share many more characteristics. Noah collected two of every insect genus or even order (Bible uses the term kind, but doesn't define it) which diversified very quickly in 5000 years (far faster than the average rate of evolution). All modern insects descended with slight modifications from a common ancestor over millions of years in different environments and niches. Clearly, number three makes the most sense and more importantly fits the available evidence. This scenario only focuses on the insect species and ignores the other classes of arthropods, the other phyla of vertebrates, or even the other kingdoms of life with their own unique traits and history. 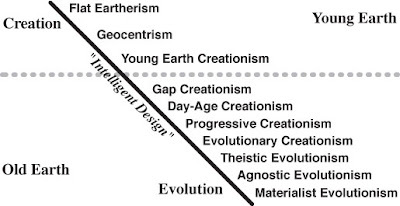 Roger Morris recently posted this case against Young-Earth Creationism (YEC) at the Faith Interface. He makes some great points and I would like to summarize them here. YEC is a fine example of the worst kind of isolationist intellectual disengagement to come out of Christian fundamentalism since the Roman Catholic church determined to stubbornly hold to Ptolemaic geocentrism in the face of clear evidence to the contrary from the likes of Copernicus, Kepler and Galileo. And, like YEC, all because of an erroneus and rigid interpretation of scripture. One reason Creationist despise evolution deals with time. Evolution requires a very old universe and old Earth. Modern science agrees that the universe is roughly 13.7 billion years old and the Earth (and our solar system) formed about 4.6 billion years ago. These estimates were determined through several lines of evidence and produced repeatable results. Creationism relies on a literal interpretation of six days for creation only 6,000 years ago only derived from the Bible. Clearly, a huge difference separates these two options. How can a religious person accept science or a scientific mind find faith in a Bible that says something different from the evidence? We must find some way to incorporate both the science and the Bible into our understanding of the universe. In a commentary for the Huffington Post, Rabbi Adam Jacobs describes the Jewish approach to understanding the act of creation. As Lewis Black would say, it's their book anyway. I have often said that the arguments between Evolution and Creationism create a false dichotomy. From the National Center for Science Education, Genie Scott promotes quality science education and created this continuum of different beliefs on the topic. As you can see, many people possess many different ideas about evolution and creationism. From Flat Earthers to Materialists, people find many ways to incorporate science and religion. Some side with all religion and no science. Others prefer all science and no religion. Most people fit somewhere in the middle. There is much diversity of opinion, even among scientist. Not all scientists are strident atheists, like a lot of people assume. Not all religious people are Young-Earth Creations, like others assume. I place myself at the level of Theistic Evolutionism. Where do you place yourself? At the 2008 World Science Festival, several scientists take the stage to debate in impact of science and religion. Maybe we can have polite conversations on the subject after all. World Science Festival 2008: Faith & Science (Excerpt) from World Science Festival on Vimeo. Nicholas Kristof offers a new quiz in response to the Pew's results from last week. If you remember, the Pew Research Center found that atheists know more about religions than believers, that most Catholics don't understand the Eucharist, and that most Protestants don't know of Martin Luther's contribution to their own religion. This test features 13 questions about more specific questions of religion. I will admit that it was far more difficult than the other. Kristof clearly had a hidden motive to this quiz. Religion is far more difficult and a few questions can suggest. And yes, the point of this little quiz is that religion is more complicated than it sometimes seems, and that we should be wary of rushing to inflammatory conclusions about any faith, especially based on cherry-picking texts. The most crucial element is perhaps not what is in our scriptures, but what is in our hearts. Francis Collins, director of the Nation Institute of Health, sat down for an interview with Big Think. Most notably, Collins led the American arm of the Human Genome Project and also wrote a book called The Language of God. As a scientists and a Christian, he has clearly found a way to reconcile science and religion in his own life. Big Think interviews people by sitting them in front of a white screen and removing the interviewer from the equation. In this case, they asked Francis Collins why it is so difficult for scientists to believe in God. Science takes on the difficult task of describing how the natural world works. Religion has taken on those questions, but focuses more on how to live your life and bigger questions. Sometimes, we get wrapped up in Genesis 1 as a description of the beginning of Earth. I tend to think of it as the best explanation a nomadic tribe 5,000 years ago could have understood. While it described the world for them, we have made enormous strides in our understanding. Thankfully, Genesis offers alternative readings, most notably that we are to be good stewards of the Earth. Jerry Coyne, author of Why Evolution is True, wrote an interesting op-ed piece for the The USA Today this weekend. In it, he dives head first into the Science-Religion Debate. Coyne claims that science and religion will never reconcile, but remain enemies until faith has ended. His point: faith and science are fundamentally incompatible. To me, religion and science seek to answer different questions and such answers have different purposes. Yes, religious texts and doctrines have made scientifically testable claims, but that is not the primary purpose of such statements. Science-sounding statements in sacred texts only sought to explain the world to a people who had no other answers. While science and literalism will be mortal enemies, science and religion can coexist. Science helps religion only by disproving its claims, while religion has nothing to add to science. Science can also help religion by displaying the majesty of the universe. Science continues to demonstrate the interconnectedness of life, a religious principle. Science helps religion weed out ancient superstitions and allows us to analyze Biblical text with a modern eye. Does religion work? It brings some of us solace, impels some to do good (and others to fly planes into buildings), and buttresses the same moral truths embraced by atheists, but does it help us better understand our world or our universe? If you take religion to explain the material workings of the world, then no it doesn't work. Religion acts as a cultural glue helping to pass on those moral truths that help a society survive. I personally believe that atheists are moral people (I reject the angry, anti-social atheist stereotype), but one could argue that acceptance of such moral truths are derived by living in a religious society. Religion helps people cope with their problems and struggles, while some people have abused religion for other reasons. There's no way of knowing whether it's true. I agree with this statement. That is why it is belief. To me, this compels tolerance of religion. We can't know for sure if it is true, like we can't be certain that it is untrue. Until then, let us search for the compatibility of science and religion. Religion should not make claims against accepted science, while science should not make claims that it cannot assess. Coyne continues by citing a survey showing that religious belief counters understanding of evolution. The problem isn't religion, but fundamentalism and literalism. Science and religion can stand together to help our society. Each offer something to people whether an understanding of nature or a look at humanity. In New Scientist, David Eagleman describes his personal position on the question of God and religion. He begins with an amazing metaphor. Our accumulated wisdom through scientific enterprise builds a pier that overlooks the vast ocean of our ignorance. New science looks out at the possibilities and seeks to expand our pier. Only our ignorance prevents our understanding. Sometimes, atheist-scientists make bold claims about the existence of God from their science. Sadly, the public mistakes their near-certainty with the ideas of all scientists. Some scientists, like Eagleman, understand that we can't ignore possibilities because we don't like them. We don't know everything and that includes the likelihood of God. Science must remain open-minded to all possibilities, because as Eagleman says, "our knowledge is vastly outstripped by our ignorance." Our main religions all developed well before our understanding of space, cells, and DNA. Like most religions, they base understanding on superstitions and lack of understanding. However, they provide shared traditions and histories and describe insights into human behavior. When it comes to the God Debate, Eagleman provides a new entry. Possibilians want to apply logic to the question of God. They avoid the avid certainty of fundamentalist theists and atheists. In the history of science and religion, uncertainty outshines our certainty every time. Both sides accept the vastness of what we don't know. Perhaps, they just look off different sides of the same pier. The Pew Forum conducted a survey of 3,412 Americans inquiring their knowledge about religion. The 32-question survey asked about the Bible and Christianity, World Religions, and Religion in Public Life. The average American scored 16 out of 32 or 50%. The interesting aspects come from the breakdown as atheists/agnostics scored the highest with 20.9 questions right. Mormons knew more about Christianity followed closely by evangelicals. These are interesting results. American society places far more emphasis on religion than other nations. We respect others' rights to worship as they please and expect the same for ourselves. With our religious leanings, one would expect us to score better on such a test. But then again, this is America. Even though most people know that teachers can't led their classes in prayers, half of our population profess the US as a strictly Christian Nation. When it comes to basic questions about our religion or others, we don't know what we are talking about. The survey provided an answer to religious literacy that does not surprise me. The single greatest predictor of religious knowledge is education. The more degrees a person has leads to a greater knowledge of religion (and almost every other category) with 20.6 questions right. Those with High School or less only answered 12.8 questions right. To me, education will always be the answer. You can go to the Pew Website and take a small portion of their test. It will give you 15 multiple choice questions. I took the test and got 100% (15 out of 15). See how you do. Good luck.